Fondation Mérieux is rolling out an action plan to fight the Ebola epidemic by strengthening West African healthcare systems through its RESAOLAB* network of biomedical analysis laboratories. The program is supported in particular by Agence Française de Développement as well as by the Department of International Cooperation of the Principality of Monaco, the Stavros Niarchos Foundation, the Islamic Development Bank, and Fondation Mérieux. Since the beginning of the Ebola outbreak, the RESAOLAB members have held regular updates to coordinate their actions and take concerted prevention measures. The president of the National Health Crisis Committee of Guinea, Dr. Aboubacar Sidiki Diakité, is also the president of Guinea’s National RESAOLAB Committee. For Dr. Diakité, the lack of appropriately equipped infrastructures and healthcare workers trained in biosecurity and the handling of dangerous pathogens has contributed to the severity of the epidemic. "It is essential to identify potential hotbeds of infection more rapidly to take the necessary precautions to contain the epidemic and protect the population," said Benoît Miribel, Director General of Fondation Mérieux. "For Fondation Mérieux, partnerships are key to address this crisis and we are building synergies with our partners, the West African ministers of health, scientific experts from Institut Pasteur and Inserm, and development agencies like Agence Française de Développement," he added. Fondation Mérieux initiated a system in June to enable affected countries to rapidly test potential Ebola specimens at the Jean Mérieux P4 laboratory in Lyon, a BSL4 facility that belongs to Fondation Mérieux and is managed by Inserm (French national health and medical research institute). It was in this laboratory that the Ebola virus responsible for the epidemic was first confirmed and characterized by Institut Pasteur Lyon in late March, 2014. The system was established with RESAOLAB member countries, Institut Pasteur and Inserm. Through RESAOLAB, Fondation Mérieux has offered secure sample kits with user guides to 9 West African countries: the 7 RESAOLAB countries (Benin, Burkina Faso, Guinea, Mali, Niger, Senegal and Togo) as well as Cameroun and Guinea-Bissau. Their transportation to the P4 Jean-Mérieux laboratory is pre-paid by Fondation Mérieux and Bioport oversees the logistics. Fondation Mérieux is working to reinforce the capacity of African biologists to handle and analyze class 4 pathogens, responsible for hemorrhagic fevers like Ebola. At the request of the Guinean Minister of Health, Dr. Jean-Louis Machuron, coordinator of the RESAOLAB program, and Dr. Christophe Peyrefitte, virologist and specialist in hemorrhagic fevers, arrived this week in Guinea to advise the ministry and conduct training programs. A biologist from Fondation Mérieux has also been made available to the Guinean Ministry of Health. The virologist Dr. Joseph Fair has been on a mission for Fondation Mérieux since August, focused on strengthening diagnostic capacities for Ebola in Sierra Leone. Dr. Fair has been at the Kenema hospital since the beginning of the outbreak and advises the minister of health of Sierra Leone. Prof. Dominique Peyramond, member of Fondation Mérieux’s board of directors and a specialist in infectious and tropical disease at the Croix Rousse hospital (Lyon, France), also ran a workshop on Ebola in Burkina Faso as part of the Clinical Biology Days held in Ouagadougou in July. At the start of the epidemic, Fondation Mérieux and its RESAOLAB partners developed training courses on biosecurity adapted to the crisis. 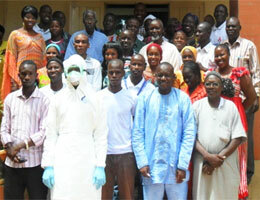 About 200 laboratory professionals have already received training in Burkina Faso, Mali and Senegal. Training courses for trainers were held in Togo and Niger and will begin in Guinea next week. A new RESAOLAB training module on hemorrhagic fevers is in development.